"On the basis of your government's present policies, the IFS predicts child poverty will rise steeply, after nine years of falling. What emergency measures will you now take to correct this trajectory and fulfil your pledge to cut the numbers of children living below the OECD recognised poverty line?" Prime Minister David Cameron, "I note that she doesn't refer to that fact that we've had a series of budgets that have not added to child poverty and the reason is we took steps to increase child tax credits, to demonstrate that while we were making cuts, we were doing so in a way that was fair… There are many things I can do in life, but making Polly happy is not one of them, I'm afraid." Polly Toynbee is a committed campaigner on child poverty. I've seen her ask equally tough questions about progress on that subject to Prime Ministers Tony Blair and Gordon Brown. But Mr Cameron not only refused to answer Ms. Toynbee's question he had a couple of digs at her too. It was an odd subject for him to judge such a petulant response would be reasonable. 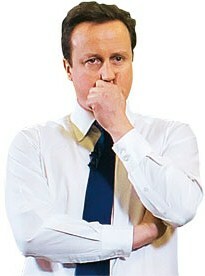 I am sure Mr. Cameron's advisers must tell him to keep that aspect of his personality under wraps. But I suspect he just can't help himself. I recall a similar response on 5th January 2010 when he did a public meeting in Hammersmith. Maxine Bayliss, one of my constituents, asked him about the safety of her home on the Queen Caroline Estate, which H&F's Conservative run Council has listed for demolition in their Local Development Framework. Mr. Cameron became visibly irritated by her question, turned his back on her and while walking away snapped, "If you don't like them stand for election?" I expect we will see more of this unbecoming characteristic next year as the Prime Minister’s economic policies begin to cut further into the fabric of our national life. There will be much greater scrutiny given to the Cameron government’s role in failing economic growth, rising unemployment, rising child poverty and plenty of other areas the Prime Minister would no doubt prefer not to be asked about.